Guest post by Kate at My Journey To Me blog. Using essential oils daily creates a happy, peaceful home environment. Did you know that essential oils can make you feel a certain way? 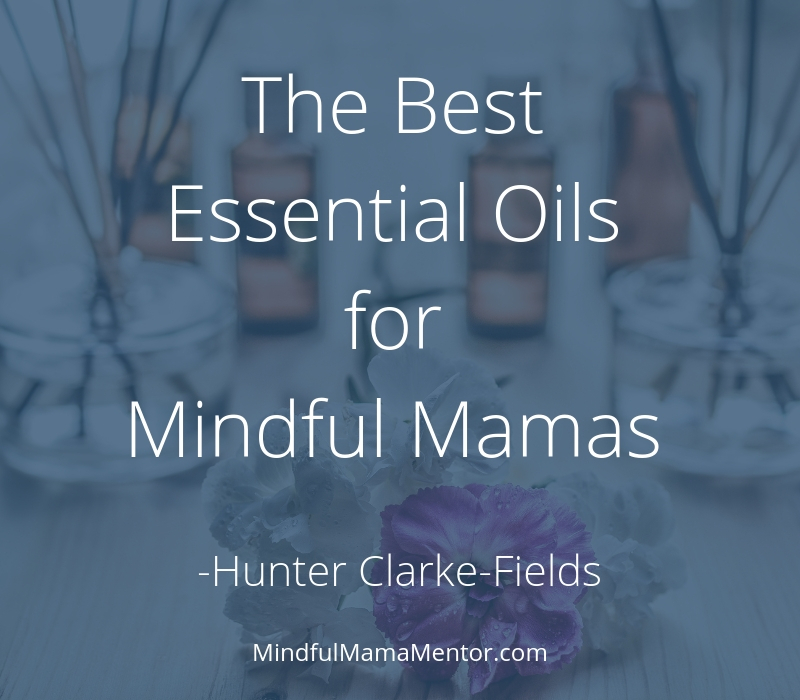 Essential oils not only smell good, but they can be one of the most effective tools in your Mindful Mama toolkit! You see, we as humans have incredible noses. Yep, you heard me right! Through our beautiful nose and sense of smell, our body uses the limbic system which sends signals to the area of our brain where cellular memories and emotions can be accessed. That area of the brain is called the amygdala, and it’s super important. Why? Because of the amygdala, we not only have the ability to tap into our emotions through our sense of smell, but we can actually trigger a response when we do. How cool is that? Think about it. Have you ever smelled something and thought to yourself – what is that smell? And then it triggered a memory and made you feel a certain way? For instance, every time I smell a certain type of coffee it reminds me of my Danish Grandmother’s kitchen, where everyone would congregate in the mornings before work. I can almost smell it as I’m writing, and it makes me smile. That is exactly how using essential oils can effectively support our emotions through our sense of smell. Essential oils can be used for extensive emotional work, like digging deep into the storage chest to clear past emotional trauma, or they can be used simply to trigger specific feelings and thoughts when we’re upset, to help ease and calm a situation. Myles was experiencing a lot of anxiety at the start of kindergarten. He liked being in class, participating and engaging with other children, but the idea of saying goodbye to me in the mornings really stressed him out. There were even a few times when the teacher had to pry him off my leg! After a week of continued stress during the morning goodbye – I decided to try something new. I made a roller bottle containing essential oils that promote happiness and confidence and had Myles use it along with an empowering mantra before we left the house in the morning. Then as he stood in line, he said the mantra at the first notion of anxiety. This dramatically and actually instantaneously turned my son’s anxieties into positive beliefs and gave him the confidence to walk into school each morning. Throughout the day, when he smelled his wrists, he was reminded of this mantra and the positive feelings associated with being in class. I can honestly tell you to this day, he has walked into school without any hesitation, frowns or tears. That remarkable blend of essential oils in Myles’ roller, (which we also call his ‘Superhero Serum,’) contains Ylang Ylang, Frankincense and Orange. These essential oils possess chemical constituents that promote grounding, a sense of calm and happiness. It’s an incredibly uplifting blend and I won’t lie – I use it myself all the time! In fact, Myles’ anxiety going into school each morning subsequently created a wrench in my own stomach. I began using a blend of peppermint, lime and bergamot essential oils to combat my own fears and doubts. Together we successfully conquered the negative emotions! Hunter shared simple techniques for nurturing self-care such as meditation, gentle yoga and journaling. They’ve had a profound effect on my ability to act more rationally and less reactively, to empathize better with my kids (and husband!) and to achieve more overall peace on the home front. As I began incorporating more self-care into my daily routine, I began using essential oils to support all of our various needs, including emotional support, immune support, sleep support and even physical support. Over time I started to witness major successes in our overall health and happiness. We started feeling better, we were getting sick less and were laughing a lot more! As the saying goes: A healthy home is a happy home! Using essential oils to support our daily needs has become a lifestyle game changer for our family. And the best part is, they’re natural, safe and incredibly effective when used correctly. Not all essential oils are created the same, so it’s important to do your homework and make sure you’re using a pure, therapeutic grade essential oil. You also want to make sure to follow the label instructions and use the essential oil as indicated. I highly recommend Young Living essential oils as they have a Seed To Seal Promise that ensures their products are therapeutic, pure and safe! This was very important to me when using essential oils around and on my kids. Below is my ‘Essential Oils Toolkit’ to help you in your Mindful Parenting journey! Create a 10ml roller bottle by adding 2 drops of Peppermint, 5 drops of Bergamot and 3 drops of Lime essential oils. Then fill the rest of the bottle with an organic carrier oil like Fractionated Coconut Oil or Grapeseed Oil. Apply this blend to your wrists, temples and the back of your neck. Diffuse this blend in a well-ventilated rooms in the mornings for energy support and to promote a happy environment. Add a drop of the essential oil to your palm and rub your palms together. Cup your hands over your nose and take three deep breaths. Rub any excess essential oil on the back of your neck and shoulders for an amazing little massage. Trust me, this feels incredible! Diffuse one or a blend of these essential oils in a well-ventilated room during meditation and quiet times to promote a sense of peace and calm. Create a 10ml roller bottle by adding 4 drops of Ylang Ylang, 4 drops of Frankincense and 4 drops of Orange essential oils. Then fill the rest of the bottle with an organic carrier oil like Fractionated Coconut Oil or Grapeseed Oil. Apply this blend to your wrists, back of ears and around your neck. Diffuse this blend in a well-ventilated room anytime to promote a happy and peaceful environment. Immune Support – A healthy home is a happy home! Create a 10ml roller bottle by adding 5 drops of Thieves, 3 drops of Frankincense and 3 drops of Lemon essential oils. Then fill the rest of the bottle with an organic carrier oil like Fractionated Coconut Oil or Grapeseed Oil. Apply this blend to the bottom of your feet daily. Create a 10ml roller bottle by adding 4 drops of Vetiver, 4 drops of Rosemary, 4 drops of Peppermint and 4 drops of Lemon essential oils. Then fill the rest of the bottle with an organic carrier oil like Fractionated Coconut Oil or Grapeseed Oil. Apply this blend behind the ears, on the base of your neck and on your wrists. Diffuse this blend during meetings or homework in a well-ventilated room to support focus and memory function. Create a 10ml roller bottle by adding 5 drops of Lavender and 5 drops of Cedarwood essential oils. Then fill the rest of the bottle with an organic carrier oil like Fractionated Coconut Oil or Grapeseed Oil. Apply this blend to the temples, neck, wrists and behind the ears. Diffuse this blend before or during bedtime in a well-ventilated room to support a good night’s rest! Create a Linen Spray using a glass or stainless steel spray bottle. Add 5 drops of each essential oil and fill the remainder of the bottle with distilled water. Spray on pillow and linens before bedtime. Note – my 3-year-old daughter LOVES her linen spray! She feels empowered when she can do it herself! As you can imagine, essential oils have an amazing ability to support us in many ways! Mindful parenting is an evolution as we grow with our children and engage in new phases and opportunities. Using essential oils consistently to support the different stages in our lives can dramatically help us in achieving more peace, calmness and happiness in the home environment. If you’d like to learn more about Young Living essential oils feel free to contact Kate here. To order Young Living essential oils click here. Kate enjoys teaching wellness through the use of essential oils and essential oil-infused products. She writes the blog My Journey To Me centered around wellness and parenting, as well as runs a FB group dedicated to educating people about a non-toxic lifestyle. Her goal is to help others achieve amazing health and happiness through pure and natural solutions. She believes one shouldn’t have to compromise their health to live life fully! Kate has three small children, ages 7, 5 and 3. She enjoys running, yoga, reading, hiking, travel, the salty ocean, mother nature and spending time with those she loves. She grew up in Rhode Island and now resides in Brookfield, IL with her husband, three children and dog Gunther.